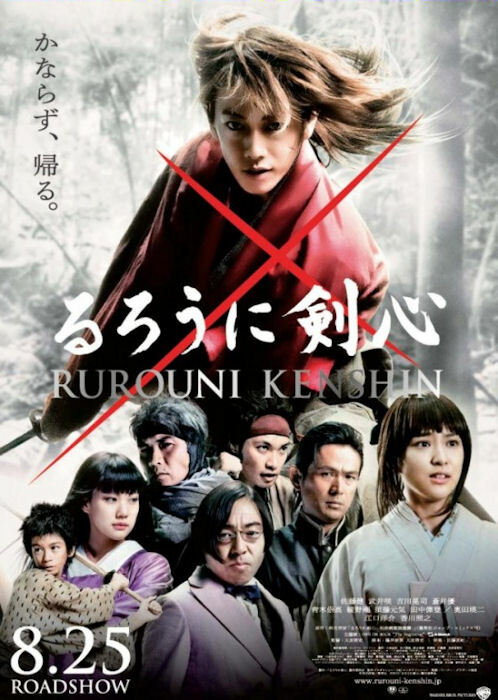 Rurouni Kenshin is, in one word, nostalgic. On the surface, it is an adaptation of a manga and anime many grew up reading and watching. However, instead of just being a 3-D reenactment, it is a samurai film that evokes Akira Kurosawa’s works and Zatoichi. The opening scene especially brings the Kurosawa-esque combination of beautiful visuals with brutal violence. 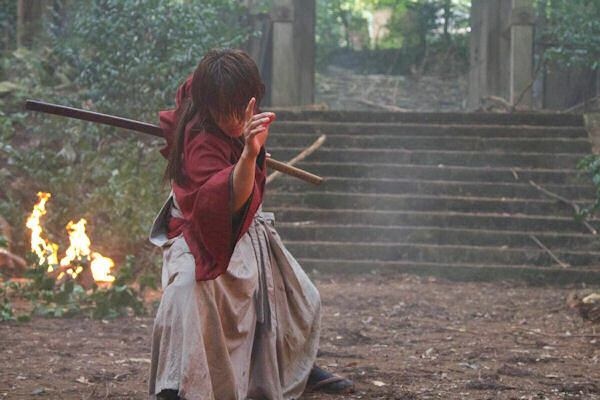 Takeru Sato also demonstrates that balance in his portrayal of Kenshin Himura. He has a delicate appearance and a quiet presence, but with a single glance, he delivers such intensity that the viewers never forget the cold assassin known as Hitokiri Battousai lurking beneath the façade. His subtle actions make the moments in which he is overcome by emotion even more potent. The other protagonists are portrayed faithfully even though much of their backstories are cut in favor of cramming two arcs into one movie. The two female characters seem to be damsels-in-distress at first, but they demonstrate that strength does not have to be physical. Emi Takei as Kaoru Kamiya, in particular, really delivers an emotionally-charged performance in a pivotal scene. Another scene stealer is Yosuke Eguchi as Kenshin’s rival Saito Hajime, a samurai-turned-government agent. Despite being less ruthless than his anime counterpart, he comes across as a hardboiled anti-hero, the perfect foil for Kenshin. He and Sato both wield their katanas effortlessly as though they are masters of their characters’ signature fighting styles. Fans of the manga/anime will be saddened by the absence of Aoshi Shinomori and his ninja crew, who were the original bodyguards to Kanryu Takeda (Teruyuki Kagawa), the film’s version of Bond villain. In their place are Gein (Gou Ayano) and Banjin Inui (Genki Sudo), who are from a later arc. Although the substitution is puzzling, both characters have such excellent fight scenes that the change can almost be overlooked. Gein and Kenshin’s showdown is a fast-paced masterpiece of cinematography and fight choreography. The best part of Rurouni Kenshin is the visuals. The time of day and weather set the mood for each scene; most fights take place in the dark while Kenshin’s daily interactions with Kaoru are brightly lit and more colorful. Little details like these work together to make a really stunning film to watch and allow it to have a sense of humor as well as a hint of romance. Rurouni Kenshin‘s wide range of emotions makes the characters less fantastical and more human. It may not be an exact recreation (and is probably best being so), but it is definitely a great addition to the franchise. Recommendation: A must-see whether you’re a fan or looking for good entertainment. I’d advise against reading the manga or watching the anime right before because of the obvious changes.